Despite not feeling well, Wallace Rikrik showed poise under pressure as he drilled the game winning basket to lead the Palau Pacific Resort (PPR) Shark Attack against a tough Galaxy Builders, 88-86 and the Business Division title, Tuesday night in Game Three of their best of three series in the ongoing 2012 season of the Rudimch Enterprise Government/Business League played at the Palau National gym. After leading 86-83 with 2.89 seconds left in the fourth quarter, Galaxy Builders’ Bong Alambra was set up for a three point shot that tied the game at 86-all with barely 1.8 seconds left in the clock. PPR Shark Attack called for a time out to set up their offense. As play resumed, Galaxy Builders focused their defense on PPR Shark Attack’s Dennis Castro and Joeger Supnet, leaving Wallace Rikrik open. Ririk received the ball just beyond the free throw line and despite being guarded by Galaxy Builders’ Emerson Patenia, Ririk pulled up for a jumper and scored the winning basket that had a resounding cheers from their fans. PPR Shark Attack closed the series with a 2-1 count. Rikrik, who was not feeling well and only played in the fourth quarter, finished the game with 10 markers. 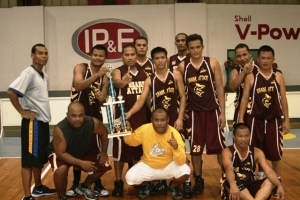 His performance complemented Division MVP Dennis Castro, who tallied 26 points, while teammate Joeger Supnet added 23. On the other hand, Galaxy Builders did not go down easily as they have to climb their way back into game being down after the first half at 48-34. Galaxy Builders would spark a 27-19 rally in the third to trim the lead at 67-61. But it was not enough as they fall short, losing streak shooter Erwin Senadre to an injury by the end of the first half. Bong Alambra topscored for Galaxy Builders with 21 as Emerson Patenia chipped in 17. In the Government Division, Ministry of Finance (MOF) Omsangel won over MPIIC, 91-66 to retain their title behind MVP Tutii Benjamin and Sunshine Soalablai who finished with identical 17 markers, respectively. Winners received their trophies immediately after the games. With the Divisions finals over, the tournament resumes with the Season Finals still at the same venue. For more information call Topps at 488-4491.